Wednesday's show was at a theater near the Alamo. The Alamo, former site of Spanish missionaries and legendary military stronghold, is now flanked by souvenir shops selling t-shirts, shot glasses, Davey Crockett hats, and Texas Ranger badges with one's name on it. Did I find a badge with my name? No. Did I find one for 'BUCKAROO'? Yes, I did. 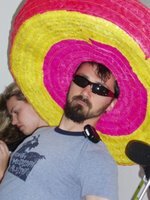 The combination of a slow work day, our nearness to the Alamo, and the sale of Teh Shrine of Texas Liberty doodads affected us in wardrobe. At one point Lana taped BORED in giant letters on the wall with yellow stage tape and appeared to be on the verge of ironing socks. During the afternoon we each took a field trip to the world outside of Benise NIGHTS OF FIRE! and returned bearing gifts. My contribution was an archery kit comprised of plastic bow, three plastic suction cup arrows, and plastic knife and sheath. I soon found out that I was much better at sitting around making fun of people than actually being able to SUCCESSFULLY SHOOT ONE SINGLE SOLITARY ARROW myself. Even after I was told that I was holding the bow backwards, the closest I got to having the arrow do more than fall limply to my feet was to toss it forward with the hand that was supposed to be snapping the string. 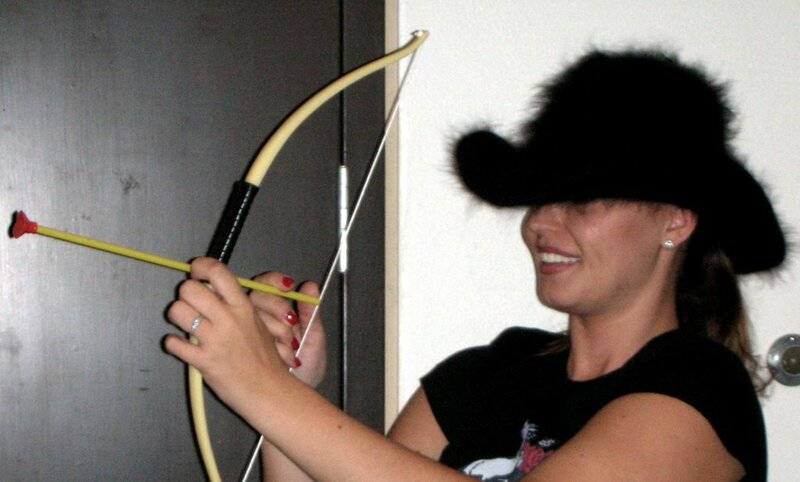 See how Lana is enjoying learning how to shoot a bow and arrow, as exhibited by her smile and easygoing posture? Every time I touched the archery kit, I'd feel my smile freeze into place and my sweat glands go into overtime because I KNEW that goddamn arrow was going to somersault lightly to my feet when it was supposed to shoot ahead in a threatening manner, suction cup notwithstanding. I did excel, however, in pursing my lips like an insufferable goody two shoes while Renee menaced a blade to my throat. Well my prissy....alas I was unable to leave the Indian Anarchy kit on the bus to suffer GOD knows what fate. It is safe, minus two arrows, en Nashville. 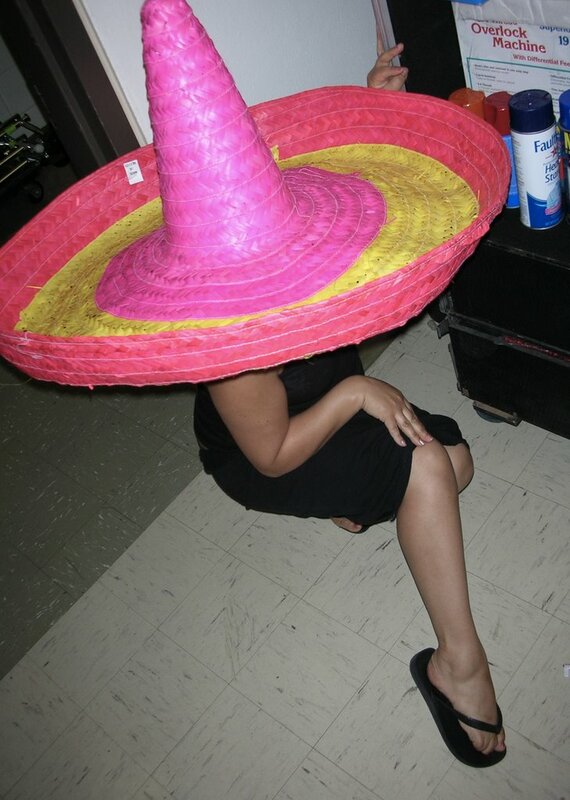 As for the sombrero...well I'm sad to say I forgot it on the bus. Whish I could be a fly in the bunk area when the cleaning crew find it in Quigly's bunk. Look for us at an Olan Mills near you! dear ights of duh-mf-duh, i would like to make a witty retortful comment but i'm too depressed that we have been separated and have to cry myself to sleep now. and i'm only partially exaggerating. i'm planning a trip to the KMart photo center to cheer myself up.